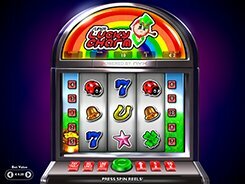 Developed by NYX, Tarot Treasures is a 5-reel 20-payline slot that would be very appealing to high rollers since the top bet reaches a jaw-dropping $2000 per spin. The slot’s theme revolves around Tarot cards, and its symbols portray magical objects or images of people that can be found on Tarot cards: Page, Queen, an occult pentagon, a unicorn, etc. The game features a wild that substitutes for other icons and doubles payouts. Hitting five wilds awards 2000 coins, the biggest prize that is equal to a staggering $200,000 if playing max bet. 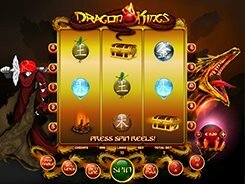 The King symbol acts as a free spins trigger; you need to get at least three Kings on a payline to win 5, 10 or 20 free spins. Furthermore, the slot offers a Pick ‘em bonus feature activated by 3+ Bonus icons depicting a fortuneteller. In the bonus game that is played on the second screen you may win as much as 3000 coins! 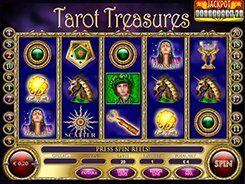 Tarot Treasure will take the fancy of all high rollers and slot fans who like mystical themes to video slots. PLAY FOR REAL MONEY!